The movie really hit me after watching it last night. The quote I see sometimes on social media is “you can’t tell from the outside what people are suffering inside”. This was the main point I got from this movie and the pain people carry around with them. As the character Lee said, “I can’t break it” – it is not as easy to say snap out of a bad mood when you have serious weights in your life you carry. Your life can be looked at as a existing between 2 goal posts ~ one being the worst pain you have ever felt in your life and the other being the most happiness. Some peoples goal posts are very narrow with a low standard deviation of a bell curve and some with high ones. In this movie they tell a story of someone who has lived though things no one should have to do. It really made me think deeper about what people’s tolerance to suffering. Also it was a movie to reflect on how people’s own selfishness gets in the way to see other’s humans pain. Also the filming style was really low key and added to the feeling of flowing in sorrow with the main character Lee. 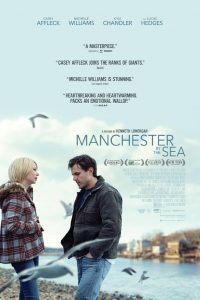 I recommend seeing it because it is something to reflect on your own life.